I had a fabulous evening in Sare. My campsite was gorgeous, set amongst lush green hills. Only, I didn’t camp. They had a gite and the rain and thunder were sweeping the valley thick and fast. It was the easy option and I took it. I shared a 6 bed room with one old man called Robere, also hiking. You’d probably be right in wanting to ask me things like ‘why are you carrying that tent if you’re never gonna use it?‘ And ‘when are you going to actually act like an adventurer and sleep outside?‘. You’d be right to ask those questions, but it doesn’t mean I’ll like you for it or that I’ll answer them, so obnoxious, why don’t you come out ere then!?! Though if you’re after adventurer action then this is the post for you! I’m currently on a farm after walking 18 miles into the thunder mountains instead of 10. Things got a little dicey on the way. Where the rucksacks haven’t destroyed my shoulders the bugs have eaten away at them. My left foot’s little toe is mostly blister. The boots are falling apart again. But interestingly this farm is on the border of Spain. The owners, back during WW2 used to help people escape the country. Given what I’ve just been through, I cannot imagine how dangerous that would have been anyway but also – during winter!? We all use language in some way. 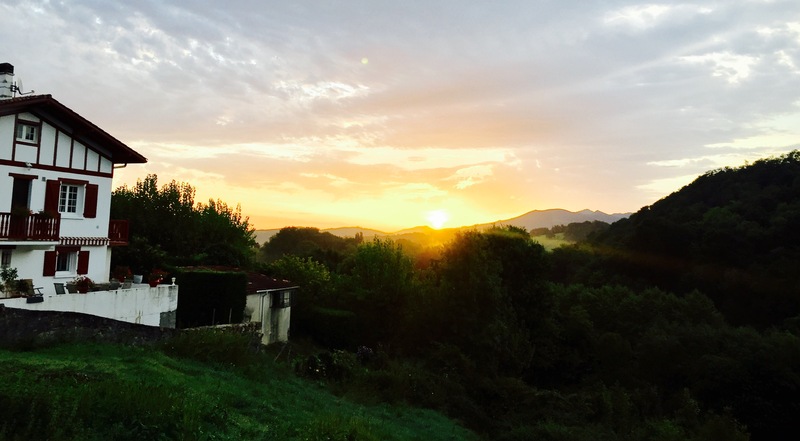 Here in the Basque Country, most people speak three languages, none of them English. The spoken word can be really useful when trying to express how you feel. For example when an insect starts nibbling at your delicious elbow and you use your new favourite French swear word ‘merde’ repeatedly as you bat it out of your skin. Only to turn a corner and see you’ve interrupted an outdoor family breakfast, kids an all. Thus affirming the old mountain saying ‘if you’ve got GROSS TOMATS you’re sperm must be incredible!’. Art can be a great way to portray the feeling of a place. It would appear the Basque people have excelled at conveying mountain life in the art that decorates their streets and restaurants. I walked through 10 miles of beautiful valley life today. Here the mountain rivers trickle together and gently pool under quaint village bridges. It was so peaceful and beautiful I began to wonder if Harrís or Heather had been meddling with my reality again. As if to confirm my suspicions I spied a farmer in bright blue trousers, checked shirt, and dark navy bonnet. Staring across his land stoically, his strong old frame was the epitome of the bold cubist style depictions I’ve seen everywhere I go in the Basque Country. It was postcard perfect. 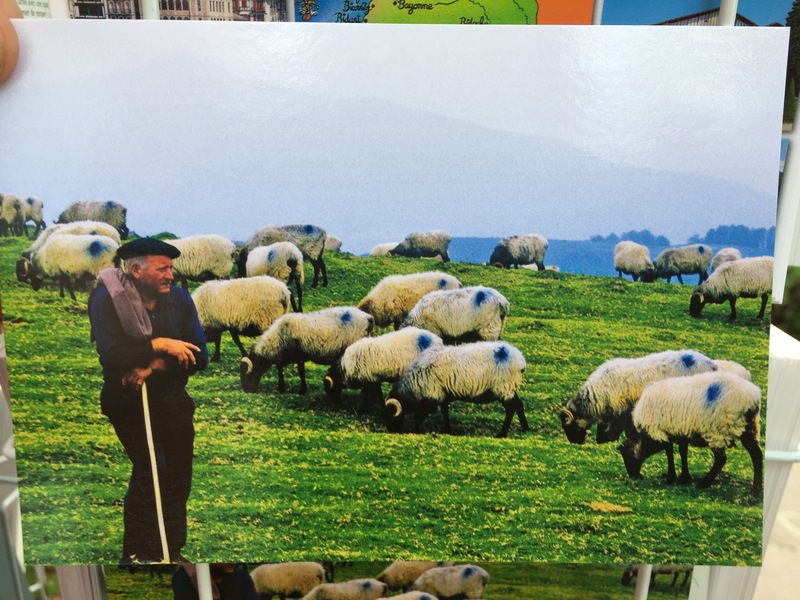 When I finally reached Ainhoa I picked up a postcard with a photo cover which could have easily been the same man. Weird. It was all too perfect. ‘This isn’t what the readers want!‘ I thought. ‘They want adventure!!‘. So I finished my delicious meal, drank my beer and headed into the mountains! I estimated it would only take me three hours to get to a good spot and I definitely had enough water for that! I was wrong on both matters. Like most places in the world both food and symbolism are important in the Basque Country. I’ve come to realise food won’t be a problem here, everything has been delicious and there’s usually four courses. 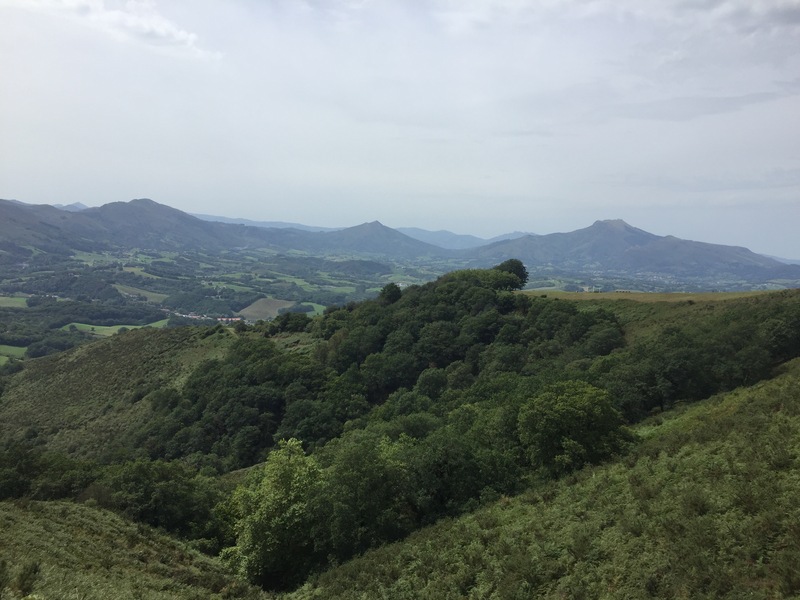 As for symbolism, there is a symbol with four circles swirling around each other which is used frequently in this region of the Basque Country. The first time I saw this symbol was on a toilet lid. I have since learnt it does not represent a flushing toilet. 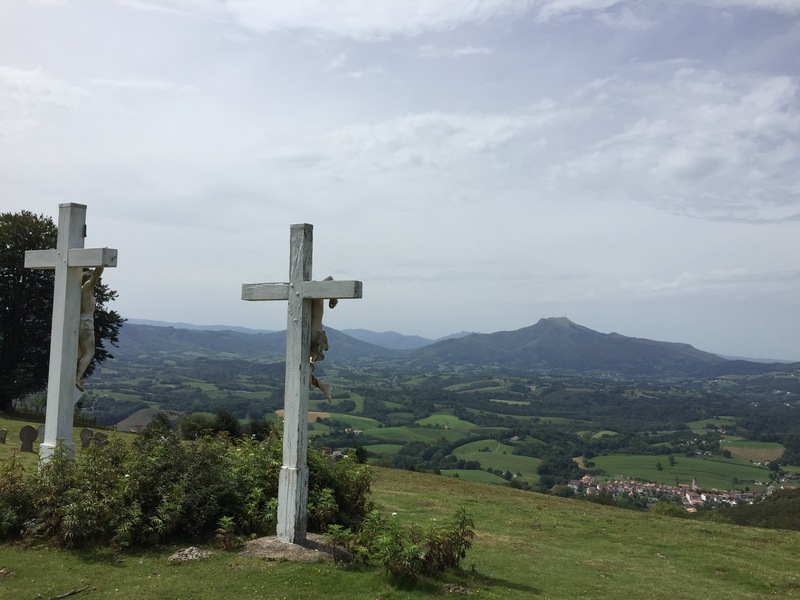 Also as I exited Ainhoa and climbed 500m of my first mountain this afternoon, I came across Jesus in statue form. Him and two other guys were nailed to the usual wooden crosses. This symbolism obviously carries a lot of meaning all over the world. Then a police car parked up next to me and the coppers inside started to eat their lunch looking out at the view. Which just goes to show – one persons lunch spot is another’s place of connection to an omnipresent celestial being. I’d already had lunch so on I shuffled. Talking about sport always gets you places. Unfortunately I know nothing about sport. In the Basque they love rugby and a sport unique to this area called ‘pelota’ which is similar to squash. The town of Sare appeared to be built around very old mini stadiums for ‘pelota’. Like a clarsy barstard I ate a takeaway pizza in one of them last night. It was one of the most beautiful moments I’ve had so far, no joke. Only one more after this I promise! The whole time I’ve been walking through this region the hills have literally been alive with the sound of bells (and sometimes gunfire). 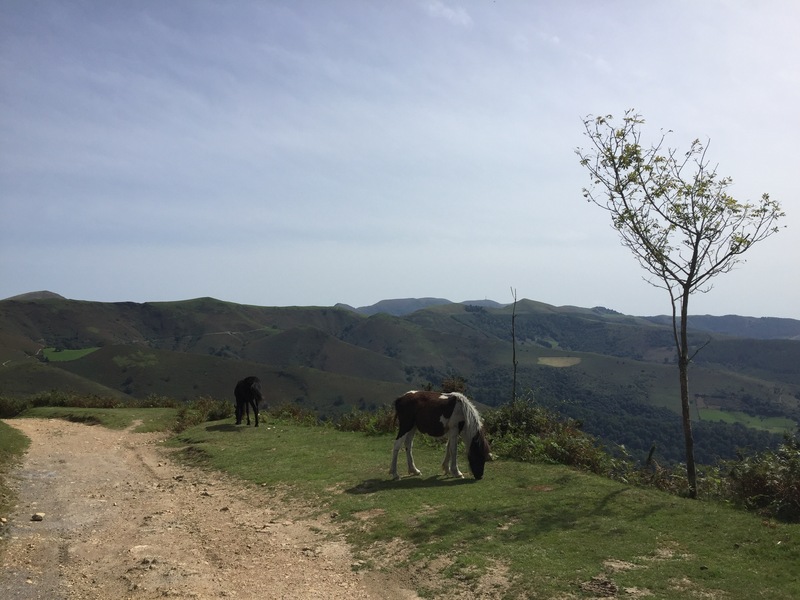 I recently learnt that the farmers here attach bells to all livestock including sheep, bulls and horses – these are the most polite horses I have ever met, they have calmly stepped out of my way on narrow forest paths to let me pass. You get the idea. Sweat is bad and it stops people communicating with you. What you really need to watch out for is when you stop sweating because you’ve run out of water on a sun baked mountain, unsure of how far the next town is, mouth dry and cracking, skin burning, all alone aside from the bulls. If you do find yourself in that situation and you come across a stream, don’t whatever you do, use that moment to start a science experiment involving antibacterial wipes and chlorine dioxide from your rucksack in an attempt to purify the water. If my experience is anything to go by it will result in a water bottle full of something resembling absynthe. Luckily I did not drink it, I limped around the corner to find a farm house where I found Göel (finally learnt how to spell her name) and Pierre drinking beer and handing me one! I couldn’t believe it. I had been 5 minutes away for about half an hour trying to purify water! The farmer has since explained that the water in that stream is probably safe anyway. Pierre being the guy he is, even arranged my room for the night with the farmer. These guys, its the second time they’ve appeared just at the right moment. Spooky. 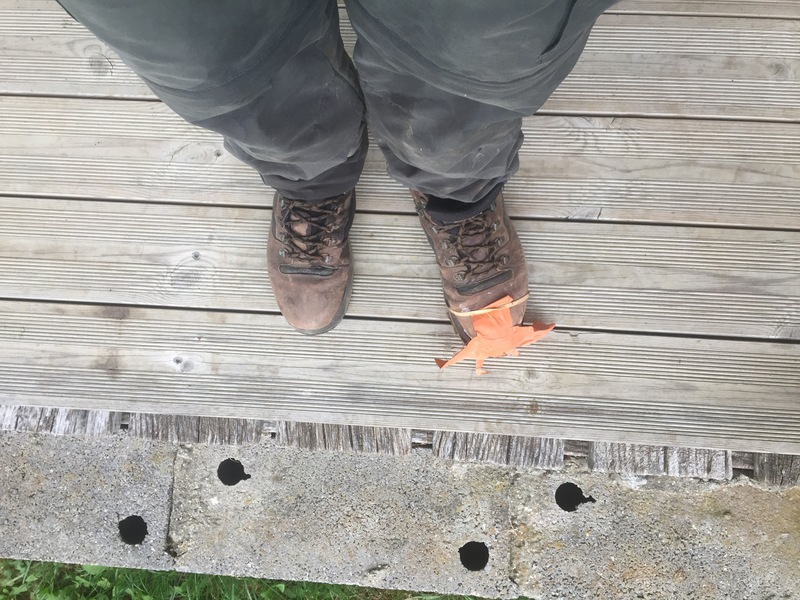 I walked eighteen miles in nine hours today and one elastic band is holding my boots together. Since I’ve been on the farm I’ve been in three thunder storms and eaten six courses of delicious farm food.